Heading back to Buriram for the fourth season, the enthusiasm for the MOTUL FIM Superbike World Championship in Thailand is nothing short of sensational and 2018 will be no different. The MOTUL Thai Round will be jam packed with action to keep fans entertained, and all members of the family are covered. Free access is available for children under 110cm with a paying adult, there will be pure action guaranteed for all. Welcoming back the world-renowned paddock show to the Chang International Circuit, there will be on stage action each day to keep fans fully up to speed with the days dramatic events, situated right behind the main grandstand. 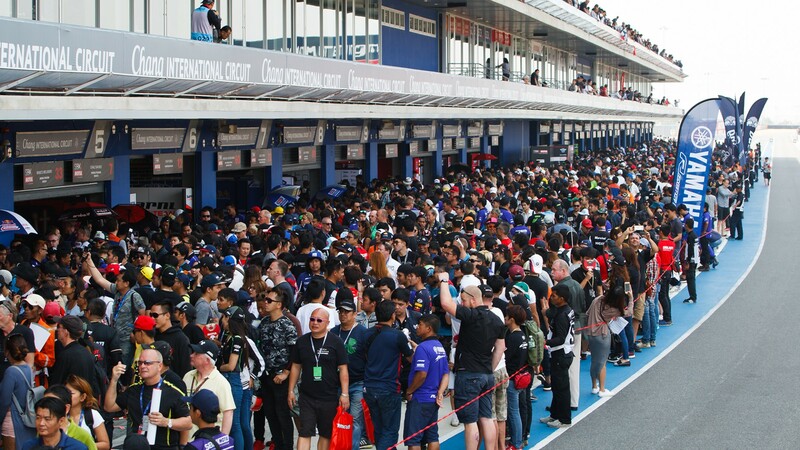 Friday hosts the Opening Day Show for both WorldSBK and WorldSSP, which means fans are able to get the inside line from the riders straight after they have debriefed with their teams. Saturday sees the SuperShow take to the stage once again, after what is set to be an adrenaline fueled day of on track action. Listen to the thoughts of the WorldSSP riders after Superpole before watching the WorldSBK Race One heroes on stage. To top Saturday off, a live band will be performing at 19.00h to really continue the party atmosphere. Songkran, The Voice of Thailand will entertain their adoring Thai fans into the night. Sunday will be the final chance for the fans to listen to the riders thoughts of the weekend, as both classes will be on stage for the Race 2 Show, giving fans the inside line on what is expected to be a stunning MOTUL Thai Round. Get into that festival spirit this weekend, as Chang International Circuit creates the place to enjoy WorldSBK action and a Thai Carnival. With a live band, motorbike stunt shows, games, lucky draws and much more, the SBK® festival will not be on to miss. Right next to the Paddock Show and behind the main grandstand, the party will start from Saturday at 10.00h until 22.00h and Sunday from 10.00h until 19.00h – with free access for all fans with a ticket. Want to carry on the festival vibes? Buriram will be holding a dance show on both Saturday and Sunday at 17.00h and 13.45h, which will not be one to miss from this unique corner of the world. MOTUL will be lighting up the track with their MOTUL Stunt Show, which can be enjoyed from the comfort of your grandstand seat. Taking to the track on Saturday and Sunday, you won’t be able to miss the stunning show on track as you wait for the WorldSBK machines to roar into life. Catch the stunts on Saturday from 11.40 – 12.10h and Sunday from 11.55 – 12.40h. Miss the MOTUL action, or just want even more? Then don’t worry, as Yamaha will have a stunt show at Turn Five on Sunday from 13.55 – 14.10h. Love nothing more than seeing the beautiful bikes on display? Then look no further than the Honda and Yamaha Bike Parades. On both Saturday and Sunday evening, the Japanese giants will parade their bikes in all their glory, giving fans a true sight of the beautiful bikes. Don’t miss out on any of the action happening around Chang International Circuit to keep you entertained even when the sensational WorldSBK bikes aren’t on track. And if the racing action gives you a thirst for competition, check out the Buriram United Go-Kart which is open all weekend and located close to the entrance gate. On-track action begins at 09.45LT (+7 GMT) with WorldSBK FP1 beginning what will be a stunning MOTUL Thai Round, all of which can be followed on the WorldSBK VideoPass.